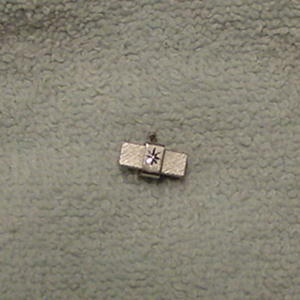 This little silver-tone textured surface rectangular bar has a wide square around its center with stylized stars on two sides and a logo of an S in a pentagon on the underside. The bottom of the square is attached at an angle to the stick pin. 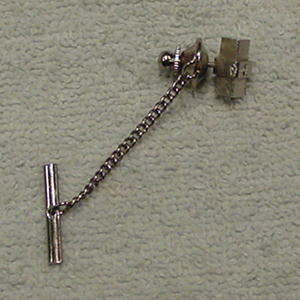 There is a silver-tone chain (1 1/2" long) and thin bar (3/4" long) attached to the side of the base. It's from a stylist's inventory, and was used for pictures for a male model's portfolio.